If you’re looking for the perfect balance of protecting your plants and creating a gorgeous view, a retaining wall may be the perfect project to pursue. The main purpose of a retaining wall, in many cases, is to provide support and reduce erosion for soil-based gardens or sloped landscape. However, retaining walls also add an artistic depth to your landscape design that makes a lasting impression. Kable Landscaping has the knowledge and experience to provide design and installation of retaining walls from basic small barrier to a complex multi-tiered step that serves as a key feature in a botanical garden. We can work with nearly any material you have in mind. We give honest quotes and produce beautiful results. Due to the incredibly hard and durable materials that retaining walls are comprised of, strength is one of the key benefits, allowing for years of support as a structural cornerstone for any garden. The materials that comprise retaining walls are relatively inexpensive, allowing for a simple, cost-effective project, while still providing the strength and stability you are looking for. 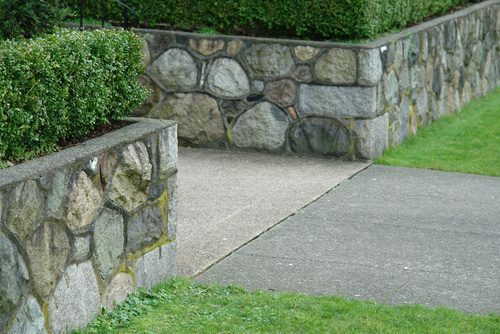 As retaining walls continue to grow a reputation as a high-end installment for any garden, they not only allow for practicality, but are also a gorgeous addition to your landscape. A retaining wall prevents erosion of land from rainfall naturally running down a sloping hill. Water naturally seeps into the ground at the barrier of a retaining wall and serves as a great hydration source for plants within the garden. Call Kable Landscaping today at (989) 695-5222 to talk to us about retaining wall options that will beautify and fortify your landscape. We look forward to hearing from you!